Charles Faurer graduated with a Bachelor’s degree in architecture from the University of Manitoba in 1938, having already registered with the Manitoba Association of Architects in 1936. Over his career, Faurer worked individually, as part of a larger and for government and specialized in the design of religious structures, retail spaces and theatre sets. During World War II Faurer was appointed by the Dominion Government as Architect to the Royal Canadian Engineers. In regard to his religious projects, Faurer’s post-war work included such notable early examples of Winnipeg Modern architecture as Shaarey Zedek Synagogue, of 1949 (with Cecil Blankstein and the firm of Green Blankstein Russell and Associates; 561 Wellington Crescent) and Rosh Pina Synagogue, of 1952 (123 Matheson Avenue). In 1947 Faurer had opened his own offices, with bureaux in Winnipeg’s Kensington Building (275 Portage Avenue; since demolished) and in Nelson, British Columbia. The following year the architect initiated his work with retail design with the flagship location of Broadway Florists, at 277 Portage Avenue in Winnipeg, a Googie-style combination of plate glass and large neon signage. The architect maintained a similar approach for his re-design of the storefront of Boston Clothing Company, at 568 Main Street, in 1949 (the building has since been dramatically altered). 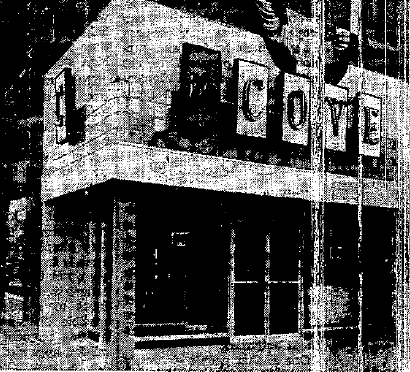 These retail projects were followed by a large number of store and restaurant designs along Portage Avenue: Genser Stoffman (235 Portage Avenue, 1950), The Fashion Shop (307 Portage Avenue, 1951), King’s Limited (396 Portage Avenue, 1952), The Cove Restaurant (Portage Avenue at Carlton Street, 1955) and Blond’s Shoe Salon (388 Portage Avenue, 1959). Faurer furthermore pursued office design, for instance his plans along what was termed a “South California style” for the Blue Cross offices at Edmonton Street and Broadway (1950). The architect also worked with Waisman Ross and Associates in the design of the Northern Sales Building (135 Lombard Avenue, 1953), one of Winnipeg’s most iconic Modernist buildings. A curious sideline of Faurer's work is his involvement in the design of a number of stage-sets over his career, in particular for Winnipeg’s Little Theatre – one of the two companies which, in 1958, formed the basis for the Manitoba Theatre Centre. Amongst the sets Faurer designed for the Little Theatre are those for Alice Sit-by-the-Fire (1935), Wind and the Rain (1936), Winterset (1936), Man with a Load of Mischief (1937), The Lovely Miracle (1937), and R.U.R. (1953). In this capacity, Faurer may have been inspired by University of Manitoba architecture professor John A. Russell, who was keenly interested in the theory and practice of set design and with whom Faurer associated in the University of Manitoba glee club. During the early 1940s Faurer designed sets for the Winnipeg Metropolitan Choir. 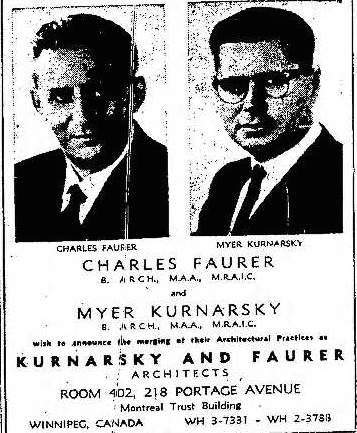 In 1947 Faurer was elected a member of the board of the Manitoba Association of Architects, a position he held for many years. Girard, Cheryl. “Stained Glass Depicts Symbols of Jewish Faith.” Winnipeg Free Press. 29 January 2011.